'X-Men: Age of Apocalypse – Termination' review: Some gems hidden throughout a hodgepodge of creative influences – AiPT! 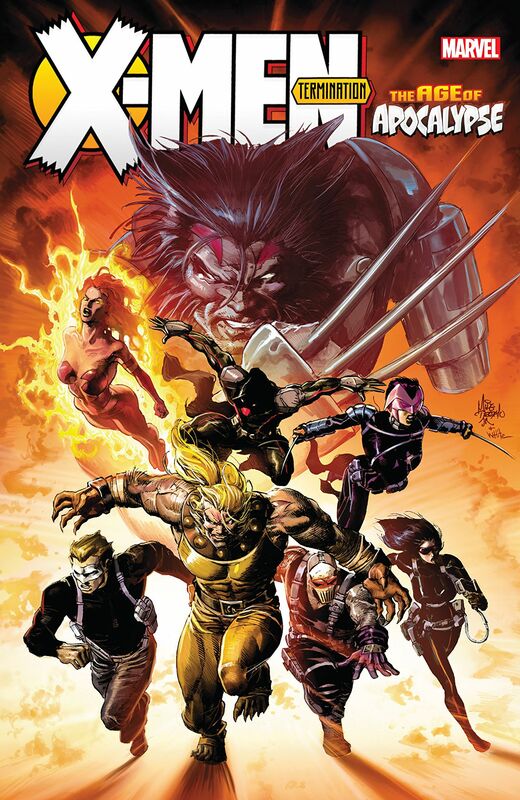 Marvel has just put out their 2012 Age of Apocalypse volume that documents the post-apocalyptic world of “Homo-superiors.” In this truly upside-down world dominated by Weapon Omega’s regime, the only hope for salvation lies in the hands of X-Terminated and the last remaining X-Men rebels. The world of Apocalypse has been referenced a lot over the years in a lot of many formats, so much so that readers were concerned it would be overkill when they dedicated yet another storyline to it in 2012. This 462 page collection documents a return to this world as the X-Terminated make a final stand against Weapon Omega in a very dark and grim tale. In addition to the Age of Apocalypse 14 issue story, this collection also includes a handful of other issues that support the storyline despite being published a couple of years before and after the main storyline. In total, this collection contains X-Force (2010) #19.1, Age of Apocalypse (2012) #1-14, X-Treme X-Men (2012) #12-13, X-Termination #1-2, Astonishing X-Men (2004) #60-61 and some segments from Point One #1. The main 2012 Age of Apocalypse arc doesn’t stand up to the original, but I found it surprisingly entertaining with a solid cast of heroes. David Lapham does a great job of creating a fresh storyline with dark spins on our favorite characters and even some surprising guest appearances not featured in the original. I’m always skeptical of human hero teams because it’s far more challenging for the writers to make the characters engaging without the superheroics. Lapham has no problem making these characters entertaining, even Goodnight, who otherwise would be very difficult to call a superhero. In my opinion, the best part of this collection is the artwork by Roberto De La Torre who asserts himself as the dominate artist in the collection. His dark and gritty artwork sets the tone for the entire arc and is perfect for setting up the violent and apocalyptic world. There are two issues within the arc that don’t feature him and the entire tone of the comic is thrown off. It’s a shame he isn’t featured throughout the entire collection. The downfall of the collection is the hodgepodge of creative influences. The inclusion of the tie-in issues is more of a disservice to the Apocalypse storyline by introducing various methods of storytelling or conflicting artistic styles that disrupt the flow of story. I can see the appeal of including issues connected by a central theme, but it gets messy when read consecutively within a trade; this feeling is only exacerbated by starting the collection off with the 12 issue Apocalypse arc only for the storyline to fray into couplet issues from X-Termination, Astonishing X-Men, and X-treme X-Men, each issue starring as many as five different artists. The content of the follow-up issues aren’t poor, but in contrast to the main storyline and the dichotomy of artistic style, these issues make for a lackluster end to an otherwise satisfying addition to the Age of Apocalypse storyline. If you’re a fan of the original story, you have to recognize that it isn’t going to be the same, but different doesn’t necessarily mean bad. De La Torre’s art is worth the read in and of itself.